While I don’t know if I’d call the image of Marines as they raise the US flag on Iwo Jima the most iconic photo of all-time, it sure must qualify high on that list. 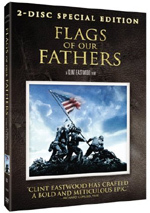 Clint Eastwood uses 2006’s Flags Of Our Fathers to show us the story behind the famous picture. I must admit I find Eastwood to be overrated as a filmmaker. Don’t interpret that to mean I think he’s bad or untalented, as neither is true. However, I don’t see that most of his work deserves the praise it receives. Of his two Best Picture winners, 1992’s Unforgiven stands as the strongest, but it remains flawed. Though it features many strengths, it comes with too many problems to stand as a great flick. However, Unforgiven significantly betters 2004’s deeply problematic Million Dollar Baby. Trite, predictable, simple and heavy-handed, that movie didn’t remotely deserve its success. One could argue Eastwood won for Baby as a “make good” for 2003’s Mystic River; many felt that flick should’ve won over actual victor The Lord of the Rings: The Return of the King. I wouldn’t argue that, as I loved King and thought River was just pretty good, but it seems like a plausible explanation for the otherwise mystifying awarded issued to Baby. I suppose it may come as some form of poetic justice that Flags stands as one of Eastwood’s best films but it won’t win the Best Picture prize. That’s because it wasn’t nominated; instead, Letters from Iwo Jima - the Japanese-centered flipside of Flags - got the Best Picture nod. I don’t know if I think the Academy made a mistake, but I do know that I like Flags. Moving, rich and satisfying, Flags stands as top-notch Eastwood. I’ll admit that part of the reason I like Flags comes from the subject matter. I’ve always been interested in World War II history, so that sort of material almost always connects with me. However, my enjoyment of WWII-based flicks is far from inevitable. I’ve seen plenty of bad movies that follow that era - Windtalkers, anyone? – and can probably find more poor WWII movies than good ones. In truth, Flags is less about the war and more about its aftermath. In that vein, it somewhat resembles 1946’s The Best Years of Our Lives. Unlike that overrated melodrama, however, Flags manages to dig into its subjects well. Eastwood’s flick balances its non-linear narrative in a surprisingly coherent manner. 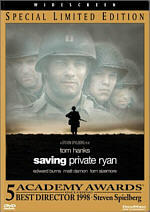 The film jumps from warfare to flag raising to subsequent events with ease and confidence. Never does the story confuse or befuddle as it skips from one area to another. Though Flags gives us a good picture of the thread leads, Hayes creates the most memorable participant. He’s easily the most complex personality of the bunch. An American Indian, Hayes confronts racism both subtle and overt, and he also deals with the worst “survivor’s guilt” of the trio. This leads to alcoholism, self-loathing and problems that don’t face the other two. Unfortunately, Flags doesn’t develop Gagnon and Bradley as well. Even though the movie is based on a book co-authored by the real Bradley’s son, “Doc” comes across as a thin sketch of a personality. We never get much of a feel for the man above and beyond his devotion to his fellow soldiers. Perhaps the involvement of Bradley’s son is part of the problem; this may have sucked some of the depth out of “Doc” since his son may have been too reverential. Whatever the case, the movie suffers a little from the absence of depth given to “Doc”. The film’s development of Gagnon falls somewhere between those two extremes. Rene comes across as easily the slickest and most opportunistic of the trio. He views the bond-selling tour as a chance to make a fine life for himself, while Bradley and especially Hayes are considerably less comfortable with the way they’re forced to turn the pain of war into propaganda. Gagnon doesn’t seem to care and often seems like something of a jerk. The movie manages to develop him better as it progresses, though I don’t think it ever quite makes him a three-dimensional personality. Despite some of these concerns, I think Flags works well. The film’s unusual focus has a lot to do with this. Most war movies don’t spend much time off the field of battle, but here we clearly see the unique circumstances that involved our leads and how these situations affected them. Much of the film does take place on Iwo Jima, but the concentration on the subsequent bond drive adds real depth to the story. While the original Flags DVD included virtually no extras, this Special Edition adds a mix of components on its second disc. We begin with an Introduction by Director Clint Eastwood. In this five-minute and five-second clip, Eastwood really offers his reflections more than he introduces anything. He discusses his own memories of the battle and the WWII era along with notes about the current status of the Iwo Jima location. It's a decent enough little piece but not anything particularly memorable. Most of the other supplements come from a collection of featurettes. Words on the Page, we get a 17-minute and two-second piece with comments from Eastwood, author James Bradley, and screenwriters William Broyles, Jr. and Paul Haggis. “Page” looks at the origins and development of Bradley’s book. We get notes about why he took on the project and his research. From there we find info about the book’s adaptation into a screenplay. Both sides of “Page” offer rich details, but the first half seems the most satisfying. Bradley provides many nice backstories about the various soldiers on Iwo Jima and fleshes them out well. The show coalesces into a nice program. Six Brave Men goes for 19 minutes, 51 seconds as we hear from Eastwood and actors Ryan Phillippe, Adam Beach, Jamie Bell, John Benjamin Hickey, Jesse Bradford, Barry Pepper, Benjamin Walker, Joseph Cross, and John Slattery. In “Men”, we get a little more info about the movie’s characters as well as casting and the performance choices made by the actors. As with “Page”, this one splits between its two topics, and it does so well. It balances the background with the filmmaking information in a tight manner that allows it to become useful and engaging. Next we find The Making of an Epic. This 30-minute and 11-second show features Eastwood, Phillippe, Pepper, Walker, Bradford, producer Robert Lorenz, director of photography Tom Stern, editor Joel Cox, costume designer Deborah Hopper, military technical advisor Sgtmaj. James D. Dever, USMC (Ret. ), production designer Henry Bumstead, art director Jack G. Taylor, Jr., special effects coordinator Steven Riley, property master Mike Sexton, and actor Paul Walker. Here we learn about Eastwood’s interest in the project, how he got involved in it, and elements of his working style. After that we move through various aspects of visual design, editing, casting, costumes and period details, and military specifics. We also find out about locations, shooting the battles, visual effects, research, props, Eastwood’s work with the actors and others, and some closing thoughts. Though “Epic” includes a lot of good details, it doesn’t explore these in a terribly logical manner. It just sort of flits from one topic to another and doesn’t manage to flow very smoothly. I like the information included, but I think the program needs to move in a more coherent manner. For the three-minute and 26-second Raising the Flag, we hear from Eastwood, Cross, Pepper, and Benjamin Walker. They give us some details of recreating the iconic flag raising. This is a perfectly serviceable little piece, though I’m not sure why it wasn’t simply incorporated into the longer “Epic”. Visual Effects lasts 14 minutes, 55 seconds and includes Eastwood, visual effects supervisor Michael Owens, Digital Domain visual effects producer Julian Levi, and Digital Domain visual effects supervisor Matthew Butler. As expected, this show looks at all the ways visual effects were used to bring the battles and other elements to life. We get a little of this material in “Epic”, but “Effects” digs into things with much greater depth. Some nice “before and after” demonstrations work especially well. All of these components allow it to become a nice exploration of the subtle use of digital elements and other forms of effects. Finally, Looking into the Past fills nine minutes, 26 seconds with archival film. We get historical footage and stills of the assault on Iwo Jima. 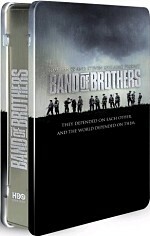 The featurette also includes a short newsreel look at the three Iwo Jima survivors whose story fills Flags. This is quite interesting to see; I wish the DVD had included more of this sort of material. An ad for Letters from Iwo Jima appears at the start of DVD One and also in its Previews area. In addition, we find a trailer for Flags on DVD Two. Flags of Our Fathers ends up as one of Clint Eastwood’s strongest movies. Indeed, it’s one of his few efforts that really connects with me. Flags tells a rich story in a clear, nuanced manner that makes it satisfying. The DVD presents excellent picture and audio along with a pretty informative collection of extras. If you don’t already own a copy of Flags, then this Special Edition is the way to go. If you do already have the original movie-only disc, then I can understand if you’re not too happy with the folks behind this re-release. They put out a bare-bones disc and follow it with a two-disc special edition barely three months later – and don’t warn people in advance that this will happen? That’s awfully tacky, and it’s the kind of move that alienates buyers. Enough people are already leery of copious double-dipping; products like this don’t help. This SE is a good release in its own right, but I’m not wild about the cynicism behind it. One other purse-strings note: you can buy this SE of Flags on its own or packaged with Letters from Iwo Jima in a “Commemorative Collector’s Edition”. That one also includes the two-disc SE of Letters and an exclusive fifth disc, and it retails for $49.96 – or about $20 less than it’d cost to get the two SEs on their own. That makes it the best deal for fans of both flicks.